Add a southwestern flair to your bedroom with the Adobe Vista Reversible Bedding and Accessories. This southwestern bedding starts with a Native American pattern tapestry coverlet in shades of brick red, mustard gold, saddle brown and turquoise and reverses to brick faux suede. 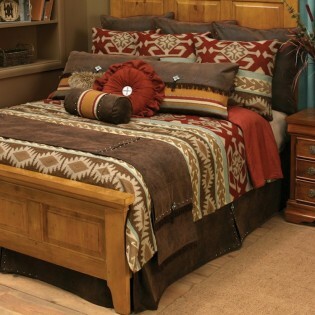 Give your bedding ensemble a truly western look with the Adobe Vista Bedskirt. Made from saddle brown faux leather with accents of antique silver studs and silver cross conchos with a turquoise centers. The Adobe Vista Pillow Shams combine a stripe fabric in warm desert shades of mustard gold, brick red, turquoise and adobe with a brown leather flap. This southwestern pillow sham is accented by a cross concho with turquoise center, silver studs and dark brown fringe. Finish your ensemble by adding Euro Shams, Super Euro Shams, Accent Pillows and a Bedrunner.